Encore Restaurant owner Jacinta Saeki shares one of her favourite homestyle recipes. 1. Finely dice onion, carrot and celery and fry in a pot with garlic and olive oil for 5 minutes. 2. 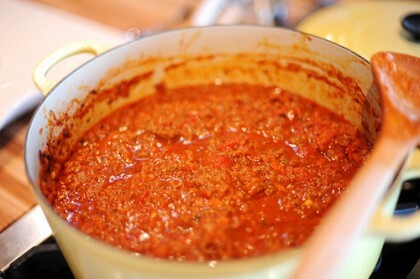 Gradually break up mince into pot stirring after each addition until all mince is used and browned. 3. Add red wine, stir, then crush peeled tomato through your fingers into the pot. 4. Simmer on low heat for 45 minutes to 1 hour stirring occasionally. The longer it cooks the better the flavour and texture. 5. When finished cooking season with salt and pepper and mix in chopped parsley. 6. Serve with your favourite pasta and cheese or use for lasagne. Encore Restaurant is open as a cafe during the day, Tuesday to Sunday, and for pre-theatre dining before the show, Tuesday to Saturday. On Sunday evenings, enjoy a delicious roast. Bookings are strongly recommended - call 801-7996 or email enquiries@encoreatcirca.co.nz.